Here at SCRAP, we get a lot of trim. It comes in all shapes and sizes. Sometimes we get whole giant rolls of it. Imagine all the possibilities. 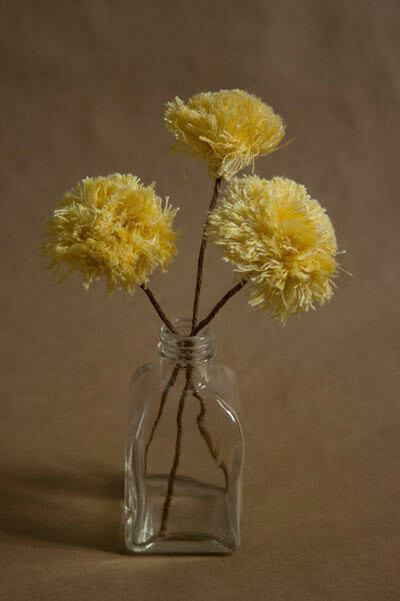 As a huge fan of the fabric flower, I love simple wrapped trim flowers. I love that one technique can be used with various trims to create very different flowers. 1. Trim your floral wire to the length of flower you’d like. 2. Cut trim to desired length. With thicker trim, you only need to wrap it once and a half around the stem for a bushy flower. Various trims will need to be wrapped at different lengths. 3. Add a touch of glue to one end of the trim. Lay end of wire in glue and fold the trim over. 4. Adding a little bit of glue to the trim at a time, slowly roll up the trim around the wire.